High quality drawings, artwork and decals; easy-to-follow layout catering for modelers working in all three main scales. Full decals provided for only two of the five subject aircraft. Just about everything a modeler needs to create an accurate model of a Jumo-engined Bf 109 – highly recommended. 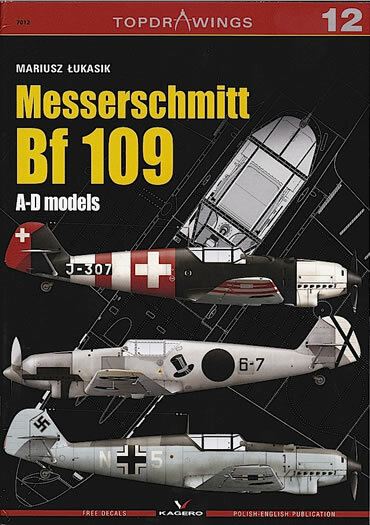 Aimed squarely at modelers, this volume is the 12th in Kagero’s well-established Topdrawings series and focuses on Jumo-engined Bf 109s. Through a combination of plans, colour profiles, airframe details, and decals, Kagero provides modelers with almost everything they will need – other than a kit – to replicate an accurate early Bf 109. Six-view black-and-white plans in 1/72, 1/48 and 1/32 of the Bf 109 A, B-1 (both early and late), C-1, C-3, and D-1 (again, both early and late). The 1/72 and 1/48 plans are contained in the book itself, while the 1/32 plans are provided as an enclosure on a folded, double-sided A2 sheet. The plans are skillfully rendered, with an emphasis on airframe outline and key panels, hatches and other features. Rivets are also depicted, but in a subtle shade that doesn’t overpower the main elements of the drawings. As for accuracy – while this is impossible to judge 100 per cent, I placed the wings and a fuselage half from my Classic Airframes Bf 109 A kit over the corresponding 1/48 plan, and they matched very closely. 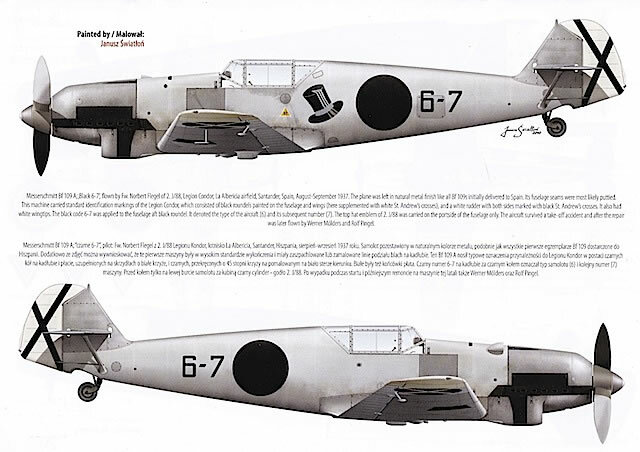 While this doesn’t necessarily prove anything, CA’s early Bf 109 kits are generally regarded as accurate, which suggests that Kagero’s plans are probably close to the mark as well (at least in some key dimensional aspects). 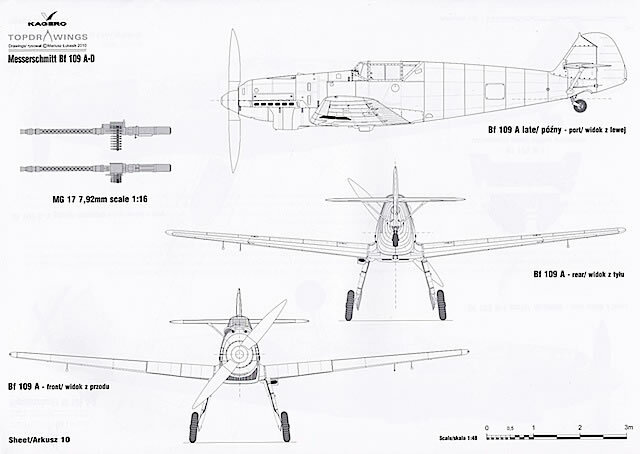 Interspersed amongst these plans are line drawings of selected airframe components, such as fuselage, engine, wings, undercarriage, and cockpit details (including the differences in instrument layout between the Bf 109 B and 109 D). Used in conjunction with photographic references, these drawings will greatly assist modelers who want to add additional detail to their kits. Bf 109 A, “Black 6-7” flown by Feldwebel Norbert Flegel of 2.J/88, Legion Condor, based at La Albericia airfield, Santander, Spain, August-September 1937. This aircraft is in the silver paint and/or natural metal scheme (depending on your references) that was applied to the first Bf 109s that arrived in Spain. 1/32 port and starboard profiles are provided. Bf 109 B-1, “Black 6-34” flown by Oberleutnant Erich Woitke of 1.J/88, Legion Condor, based at Alfamen airfield, Spain, February 1938. This aircraft is finished in the RLM 70 Black Green/RLM 71 Dark Green splinter scheme over RLM 65 Light Blue. Again, 1/32 port and starboard profiles are provided. Bf 109 D-1, “White J-307”/W.Nr.2302, Swiss Air Force, based at Dubendorf, Switzerland, June 1945. This very colourful machine has had its original German camouflage of RLM 70 over RLM 65 largely overpainted with full Swiss red and white neutrality markings. Four view 1/72 illustrations of this aircraft are provided, in addition to the 1/32 port and starboard profiles. Bf 109 D-1, “Black chevron/arrow” of Stab 1./JG 131, based at Jesau, Germany, Spring 1938. This aircraft is also finished in an RLM 70/71 splinter over RLM 65. A port profile only of this aircraft is provided, on the back cover of the book. Bf 109 D-1, “White N+5”, flown by Leutnant Joachim Bohner of 10. (N)/ZG 76, based at Hage, Germany, January 1940. This aircraft is in RLM 71/RLM 02 RLM Grey splinter over RLM 65, with the RLM 65 extending up the fuselage sides to the level of the cockpit sill. Again, a port profile of this aircraft is provided on the back cover. 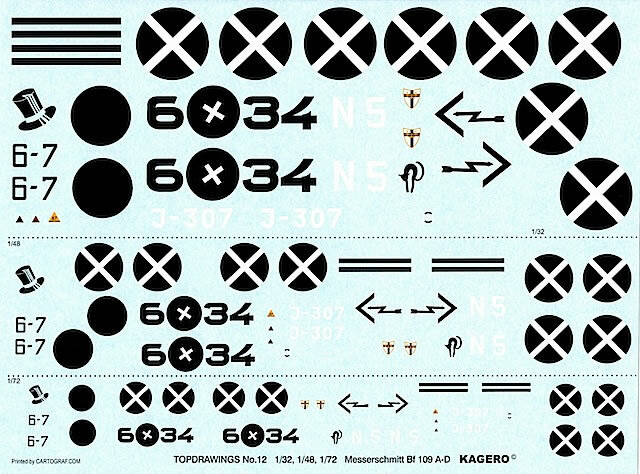 An A4 decal sheet featuring key markings for the above aircraft in 1/32, 1/48 and 1/72 scales. Produced by Cartograf, the decals appear to be crisply printed with good colour density. However, full sets of markings are only provided for the two Legion Condor aircraft. While individual and unit identification markings are supplied for the Swiss and Luftwaffe machines, national markings will need to sourced from elsewhere. 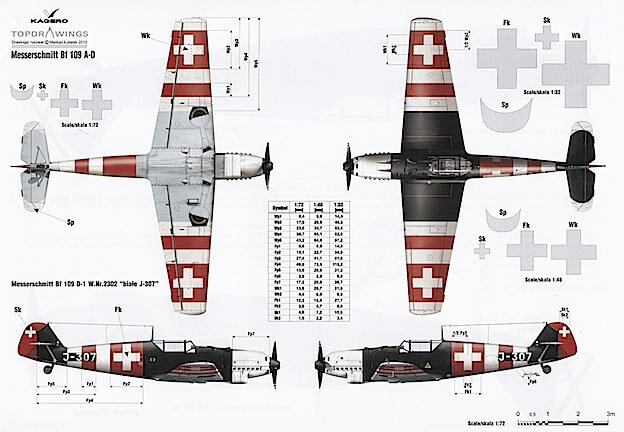 For modelers tackling the Swiss subject who are confident enough to paint their own national markings, Kagero provides templates in all three scales. Only a few stencils are provided, but these include the unique handling instructions on the leading edge of the wings of the Swiss aircraft. A detailed breakdown of the distinguishing external differences between the Bf 109 A, B, C, and D models. These differences are described both in writing and through a series of 1/72 black-and-white drawings. Text throughout the book is provided in both English and Polish. However, because the publication’s focus is on illustrations rather than writing, with text making up only a small portion of the contents, this duplication is not in any way distracting. A bibliography is also provided for anyone who wants to conduct further research on the subject. With good to excellent early Bf 109 kits and/or conversions now available in 1/72, 1/48, and 1/32 scales, Kagero’s latest Topdrawings book and decal package is a boon for anyone interested in modeling one of these Jumo-engined machines. 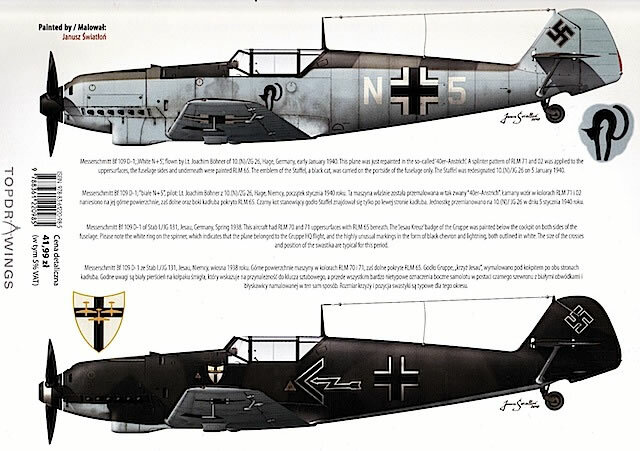 It won’t be the last word in interpreting the differences between (and sometimes within) the Bf 109 A, B, C, and D series – this is still a much debated subject, and new information continues to emerge. But used in combination with photographic references (I’m always reluctant to rely exclusively on drawings and colour profiles), this book will provide modelers with a wealth of information that until now has not been readily available from a single source.